Not to be confused with Dewey Decimal Classification or Duodecimo. This article contains special characters. Without proper rendering support, you may see question marks, boxes, or other symbols. The duodecimal system (also known as base 12 or dozenal) is a positional notation numeral system using twelve as its base. The number twelve (that is, the number written as "12" in the base ten numerical system) is instead written as "10" in duodecimal (meaning "1 dozen and 0 units", instead of "1 ten and 0 units"), whereas the digit string "12" means "1 dozen and 2 units" (i.e. the same number that in decimal is written as "14"). Similarly, in duodecimal "100" means "1 gross", "1000" means "1 great gross", and "0.1" means "1 twelfth" (instead of their decimal meanings "1 hundred", "1 thousand", and "1 tenth"). The number twelve, a superior highly composite number, is the smallest number with four non-trivial factors (2, 3, 4, 6), and the smallest to include as factors all four numbers (1 to 4) within the subitizing range, and the smallest abundant number. As a result of this increased factorability of the radix and its divisibility by a wide range of the most elemental numbers (whereas ten has only two non-trivial factors: 2 and 5, and not 3, 4, or 6), duodecimal representations fit more easily than decimal ones into many common patterns, as evidenced by the higher regularity observable in the duodecimal multiplication table. As a result, duodecimal has been described as the optimal number system. Of its factors, 2 and 3 are prime, which means the reciprocals of all 3-smooth numbers (such as 2, 3, 4, 6, 8, 9, 12, 16, 18, 24, 27, 32, 36, ...) have a terminating representation in duodecimal. In particular, the five most elementary fractions (​ 1⁄2, ​ 1⁄3, ​ 2⁄3, ​ 1⁄4 and ​ 3⁄4) all have a short terminating representation in duodecimal (0.6, 0.4, 0.8, 0.3 and 0.9, respectively), and twelve is the smallest radix with this feature (because it is the least common multiple of 3 and 4). This all makes it a more convenient number system for computing fractions than most other number systems in common use, such as the decimal, vigesimal, binary, octal and hexadecimal systems. Although the trigesimal and sexagesimal systems (where the reciprocals of all 5-smooth numbers terminate) do even better in this respect, this is at the cost of unwieldy multiplication tables and a much larger number of symbols to memorize. In this section, numerals are based on decimal places. For example, 10 means ten, 12 means twelve. Languages using duodecimal number systems are uncommon. Languages in the Nigerian Middle Belt such as Janji, Gbiri-Niragu (Gure-Kahugu), Piti, and the Nimbia dialect of Gwandara; the Chepang language of Nepal and the Maldivian language (Dhivehi) of the people of the Maldives and Minicoy Island in India are known to use duodecimal numerals. Germanic languages have special words for 11 and 12, such as eleven and twelve in English. However, they are considered to come from Proto-Germanic *ainlif and *twalif (respectively one left and two left), both of which were decimal. Historically, units of time in many civilizations are duodecimal. There are twelve signs of the zodiac, twelve months in a year, and the Babylonians had twelve hours in a day (although at some point this was changed to 24.) Traditional Chinese calendars, clocks, and compasses are based on the twelve Earthly Branches. There are 12 inches in an imperial foot, 12 troy ounces in a troy pound, 12 old British pence in a shilling, 24 (12×2) hours in a day, and many other items counted by the dozen, gross (144, square of 12) or great gross (1728, cube of 12). The Romans used a fraction system based on 12, including the uncia which became both the English words ounce and inch. Pre-decimalisation, Ireland and the United Kingdom used a mixed duodecimal-vigesimal currency system (12 pence = 1 shilling, 20 shillings or 240 pence to the pound sterling or Irish pound), and Charlemagne established a monetary system that also had a mixed base of twelve and twenty, the remnants of which persist in many places. The importance of 12 has been attributed to the number of lunar cycles in a year, and also to the fact that humans have 12 finger bones (phalanges) on one hand (three on each of four fingers). It is possible to count to 12 with the thumb acting as a pointer, touching each finger bone in turn. A traditional finger counting system still in use in many regions of Asia works in this way, and could help to explain the occurrence of numeral systems based on 12 and 60 besides those based on 10, 20 and 5. 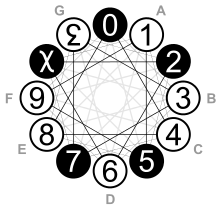 In this system, the one (usually right) hand counts repeatedly to 12, displaying the number of iterations on the other (usually left), until five dozens, i. e. the 60, are full. In a duodecimal place system twelve is written as 10, but there are numerous proposals for how to write ten and eleven. The simplified notations use only basic and easy to access letters such as A and B (as in the hexadecimal and vigesimal), T and E (initials of Ten and Eleven), X and Z. Some employ Greek letters such as δ (standing for Greek δέκα 'ten') and ε (for Greek ένδεκα 'eleven'), or τ and ε. Frank Emerson Andrews, an early American advocate for duodecimal, suggested and used in his book New Numbers an X (from the Roman numeral for ten) and a script E (ℰ, U+2130). The Dozenal Society of Great Britain proposes a rotated digit two 2 for ten and a reversed or rotated digit three 3 for eleven. This notation was introduced by Sir Isaac Pitman. , the symbols devised by William Addison Dwiggins. After the Pitman digits (32) were added to Unicode the DSA took a vote and then began publishing content using the Pitman digits instead. They still use the letters X and E as the equivalent in ASCII text. Other proposals are more creative or aesthetic, for example, Edna Kramer in her 1951 book The Main Stream of Mathematics used a six-pointed asterisk (sextile) ⚹ for ten and a hash (or octothorpe) # for eleven. The symbols were chosen because they are available in typewriters and already present in telephone dials. This notation was used in publications of the Dozenal Society of America in the period 1974–2008. Many don't use any Arabic numerals under the principle of "separate identity." In March 2013, a proposal was submitted to include the digit forms for ten and eleven propagated by the Dozenal Societies of Great Britain and America in the Unicode Standard. Of these, the British/Pitman forms were accepted for encoding as characters at code points U+218A ↊ TURNED DIGIT TWO and U+218B ↋ TURNED DIGIT THREE. They were included in the Unicode 8.0 release in June 2015. Fonts which support these characters include EB Garamond, Everson Mono, and Squarish Sans CT. As these Unicode symbols are not rendering in many browsers, this article uses U+2D52 ⵒ TIFINAGH LETTER YAP and U+0190 Ɛ LATIN CAPITAL LETTER OPEN E, or physically rotated '2' and '3' glyphs. The turned digits two and three are available in LaTeX as \textturntwo and \textturnthree. There are also varying proposals of how to distinguish a duodecimal number from a decimal one. They include italicizing duodecimal numbers "54 = 64", adding a "Humphrey point" (a semicolon ";" instead of a decimal point ".") to duodecimal numbers "54;6 = 64.5", or some combination of the two. Others use subscript or affixed labels to indicate the base, allowing for more than decimal and duodecimal to be represented (for single letters 'z' from "dozenal" is used as 'd' would mean decimal) such as "54z = 64d," "5412 = 6410" or "doz 54 = dec 64." Programming languages limited to ASCII could use a prefix, similar to 0x used for hexadecimal, perhaps 0z but there is no standard. Multiple digits in this are pronounced differently. 12 is "one do two", 30 is "three do", 100 is "one gro", BA9 (ET9) is "el gro dek do nine", B8,65A,300 (E8,65T,300) is "el do eight bi-mo, six gro five do dek mo, three gro", and so on. William James Sidis used 12 as the base for his constructed language Vendergood in 1906, noting it being the smallest number with four factors and the prevalence in commerce. The case for the duodecimal system was put forth at length in F. Emerson Andrews' 1935 book New Numbers: How Acceptance of a Duodecimal Base Would Simplify Mathematics. Emerson noted that, due to the prevalence of factors of twelve in many traditional units of weight and measure, many of the computational advantages claimed for the metric system could be realized either by the adoption of ten-based weights and measure or by the adoption of the duodecimal number system. Both the Dozenal Society of America and the Dozenal Society of Great Britain promote widespread adoption of the base-twelve system. They use the word "dozenal" instead of "duodecimal" to avoid the more overtly base-ten terminology. It should be noted that the etymology of 'dozenal' is itself also an expression based on base-ten terminology since 'dozen' is a direct derivation of the French word 'douzaine' which is a derivative of the French word for twelve, douze which is related to the old French word 'doze' from Latin 'duodecim'. Since at least as far back as 1945 some members of the Dozenal Society of America and Duodecimal Society of Great Britain have suggested that a more apt word would be 'uncial'. Uncial is a derivation of the Latin word 'one-twelfth' which is 'uncia' and also the base-twelve analogue of the Latin word 'one-tenth' which is 'decima'. In the same manner as decimal comes from the Latin word for one-tenth decima, (Latin for ten was decem), the direct analogue for a base-twelve system is uncial. The duodecimal tables are easy to master, easier than the decimal ones; and in elementary teaching they would be so much more interesting, since young children would find more fascinating things to do with twelve rods or blocks than with ten. Anyone having these tables at command will do these calculations more than one-and-a-half times as fast in the duodecimal scale as in the decimal. This is my experience; I am certain that even more so it would be the experience of others. But the final quantitative advantage, in my own experience, is this: in varied and extensive calculations of an ordinary and not unduly complicated kind, carried out over many years, I come to the conclusion that the efficiency of the decimal system might be rated at about 65 or less, if we assign 100 to the duodecimal. In Jorge Luis Borges' short story "Tlön, Uqbar, Orbis Tertius" Herbert Ashe, a melancholy English engineer, working for the Southern Argentine Railway company, is converting a duodecimal number system to a hexadecimal system. He leaves behind on his death in 1937 a manuscript Orbis Tertius that posthumously identifies him as one of the anonymous authors of the encyclopaedia of Tlön. In Leo Frankowski's Conrad Stargard novels, Conrad introduces a duodecimal system of arithmetic at the suggestion of a merchant, who is accustomed to buying and selling goods in dozens and grosses, rather than tens or hundreds. He then invents an entire system of weights and measures in base twelve, including a clock with twelve hours in a day, rather than twenty-four hours. In Lee Carroll's Kryon: Alchemy of the Human Spirit, a chapter is dedicated to the advantages of the duodecimal system. The duodecimal system is supposedly suggested by Kryon (a fictional entity believed in by New Age circles) for all-round use, aiming at better and more natural representation of nature of the Universe through mathematics. An individual article "Mathematica" by James D. Watt (included in the above publication) exposes a few of the unusual symmetry connections between the duodecimal system and the golden ratio, as well as provides numerous number symmetry-based arguments for the universal nature of the base-12 number system. In "Little Twelvetoes", American television series Schoolhouse Rock! portrayed an alien child using base-twelve arithmetic, using "dek", "el" and "doh" as names for ten, eleven and twelve, and Andrews' script-X and script-E for the digit symbols. The number 12 has six factors, which are 1, 2, 3, 4, 6, and 12, of which 2 and 3 are prime. The decimal system has only four factors, which are 1, 2, 5, and 10, of which 2 and 5 are prime. Vigesimal (base 20) adds two factors to those of ten, namely 4 and 20, but no additional prime factor. Although twenty has 6 factors, 2 of them prime, similarly to twelve, it is also a much larger base, and so the digit set and the multiplication table are much larger. Binary has only two factors, 1 and 2, the latter being prime. Hexadecimal (base 16) has five factors, adding 4, 8 and 16 to those of 2, but no additional prime. Trigesimal (base 30) is the smallest system that has three different prime factors (all of the three smallest primes: 2, 3 and 5) and it has eight factors in total (1, 2, 3, 5, 6, 10, 15, and 30). Sexagesimal—which the ancient Sumerians and Babylonians among others actually used—adds the four convenient factors 4, 12, 20, and 60 to this but no new prime factors. The smallest system that has four different prime factors is base 210 and the pattern follows the primorials. In all base systems, there are similarities to the representation of multiples of numbers which are one less than the base. This section is about the divisibility rules in duodecimal. Any integer is divisible by 1. If a number is divisible by 2 then the unit digit of that number will be 0, 2, 4, 6, 8 or ⵒ. If a number is divisible by 3 then the unit digit of that number will be 0, 3, 6 or 9. If a number is divisible by 4 then the unit digit of that number will be 0, 4 or 8. To test for divisibility by 5, double the units digit and subtract the result from the number formed by the rest of the digits. If the result is divisible by 5 then the given number is divisible by 5. 13 rule => |1-2*3| = 5 which is divisible by 5. 2Ɛⵒ5 rule => |2Ɛⵒ-2*5| = 2Ɛ0(5*70) which is divisible by 5(or apply the rule on 2Ɛ0). To test for divisibility by 5, subtract the units digit and triple of the result to the number formed by the rest of the digits. If the result is divisible by 5 then the given number is divisible by 5. 13 rule => |3-3*1| = 0 which is divisible by 5. 2Ɛⵒ5 rule => |5-3*2Ɛⵒ| = 8Ɛ1(5*195) which is divisible by 5(or apply the rule on 8Ɛ1). Form the alternating sum of blocks of two from right to left. If the result is divisible by 5 then the given number is divisible by 5. This rule comes from 101, since 101 = 5*25, thus this rule can be also tested for the divisibility by 25. 97,374,627 => 27-46+37-97 = -7Ɛ which is divisible by 5. If a number is divisible by 6 then the unit digit of that number will be 0 or 6. To test for divisibility by 7, triple the units digit and add the result to the number formed by the rest of the digits. If the result is divisible by 7 then the given number is divisible by 7. 12 rule => |3*2+1| = 7 which is divisible by 7. 271Ɛ rule => |3*Ɛ+271| = 29ⵒ(7*4ⵒ) which is divisible by 7(or apply the rule on 29ⵒ). To test for divisibility by 7, subtract the units digit and double the result from the number formed by the rest of the digits. If the result is divisible by 7 then the given number is divisible by 7. 12 rule => |2-2*1| = 0 which is divisible by 7. 271Ɛ rule => |Ɛ-2*271| = 513(7*89) which is divisible by 7(or apply the rule on 513). To test for divisibility by 7, 4 times the units digit and subtract the result from the number formed by the rest of the digits. If the result is divisible by 7 then the given number is divisible by 7. 12 rule => |4*2-1| = 7 which is divisible by 7. 271Ɛ rule => |4*Ɛ-271| = 235(7*3Ɛ) which is divisible by 7(or apply the rule on 235). Form the alternating sum of blocks of three from right to left. If the result is divisible by 7 then the given number is divisible by 7. This rule comes from 1001, since 1001 = 7*11*17, thus this rule can be also tested for the divisibility by 11 and 17. 386,967,443 => 443-967+386 = -168 which is divisible by 7. If the 2-digit number formed by the last 2 digits of the given number is divisible by 8 then the given number is divisible by 8.
rule => since 48(8*7) divisible by 8, then 1Ɛ48 is divisible by 8.
rule => since 20(8*3) divisible by 8, then 4120 is divisible by 8. If the 2-digit number formed by the last 2 digits of the given number is divisible by 9 then the given number is divisible by 9.
rule => since 23(9*3) divisible by 9, then 7423 is divisible by 9.
rule => since 30(9*4) divisible by 9, then 8330 is divisible by 9. If the number is divisible by 2 and 5 then the number is divisible by ⵒ. If the sum of the digits of a number is divisible by Ɛ then the number is divisible by Ɛ (the equivalent of casting out nines in decimal). rule => 2+9 = Ɛ which is divisible by Ɛ, then 29 is divisible by Ɛ.
rule => 6+1+Ɛ+1+3 = 1ⵒ which is divisible by Ɛ, then 61Ɛ13 is divisible by Ɛ. If a number is divisible by 10 then the unit digit of that number will be 0. Sum the alternate digits and subtract the sums. If the result is divisible by 11 the number is divisible by 11 (the equivalent of divisibility by eleven in decimal). rule => |6-6| = 0 which is divisible by 11, then 66 is divisible by 11.
rule => |(9+2)-(4+7)| = |ⵒ-ⵒ| = 0 which is divisible by 11, then 9427 is divisible by 11. If the number is divisible by 2 and 7 then the number is divisible by 12. If the number is divisible by 3 and 5 then the number is divisible by 13. If the 2-digit number formed by the last 2 digits of the given number is divisible by 14 then the given number is divisible by 14.
rule => since 68(14*5) divisible by 14, then 1468 is divisible by 14.
rule => since 94(14*7) divisible by 14, then 7394 is divisible by 14. As explained in recurring decimals, whenever an irreducible fraction is written in radix point notation in any base, the fraction can be expressed exactly (terminates) if and only if all the prime factors of its denominator are also prime factors of the base. Thus, in base-ten (= 2×5) system, fractions whose denominators are made up solely of multiples of 2 and 5 terminate: 1/8 = 1/(2×2×2), 1/20 = 1/(2×2×5) and 1/500 = 1/(2×2×5×5×5) can be expressed exactly as 0.125, 0.05 and 0.002 respectively. 1/3 and 1/7, however, recur (0.333... and 0.142857142857...). In the duodecimal (= 2×2×3) system, 1/8 is exact; 1/20 and 1/500 recur because they include 5 as a factor; 1/3 is exact; and 1/7 recurs, just as it does in decimal. The number of denominators which give terminating fractions within a given number of digits, say n, in a base b is the number of factors (divisors) of bn, the nth power of the base b (although this includes the divisor 1, which does not produce fractions when used as the denominator). The number of factors of bn is given using its prime factorization. For decimal, 10n = 2n * 5n. The number of divisors is found by adding one to each exponent of each prime and multiplying the resulting quantities together. Factors of 10n = (n+1)(n+1) = (n+1)2. Because both ten and twelve have two unique prime factors, the number of divisors of bn for b = 10 or 12 grows quadratically with the exponent n (in other words, of the order of n2). The Dozenal Society of America argues that factors of 3 are more commonly encountered in real-life division problems than factors of 5. Thus, in practical applications, the nuisance of repeating decimals is encountered less often when duodecimal notation is used. Advocates of duodecimal systems argue that this is particularly true of financial calculations, in which the twelve months of the year often enter into calculations. However, when recurring fractions do occur in duodecimal notation, they are less likely to have a very short period than in decimal notation, because 12 (twelve) is between two prime numbers, 11 (eleven) and 13 (thirteen), whereas ten is adjacent to the composite number 9. Nonetheless, having a shorter or longer period doesn't help the main inconvenience that one does not get a finite representation for such fractions in the given base (so rounding, which introduces inexactitude, is necessary to handle them in calculations), and overall one is more likely to have to deal with infinite recurring digits when fractions are expressed in decimal than in duodecimal, because one out of every three consecutive numbers contains the prime factor 3 in its factorization, whereas only one out of every five contains the prime factor 5. All other prime factors, except 2, are not shared by either ten or twelve, so they do not influence the relative likeliness of encountering recurring digits (any irreducible fraction that contains any of these other factors in its denominator will recur in either base). Also, the prime factor 2 appears twice in the factorization of twelve, whereas only once in the factorization of ten; which means that most fractions whose denominators are powers of two will have a shorter, more convenient terminating representation in duodecimal than in decimal representation (e.g. 1/(22) = 0.25 ten = 0.3 twelve; 1/(23) = 0.125 ten = 0.16 twelve; 1/(24) = 0.0625 ten = 0.09 twelve; 1/(25) = 0.03125 ten = 0.046 twelve; etc.). Values in bold indicate that value is exact. The representations of irrational numbers in any positional number system (including decimal and duodecimal) neither terminate nor repeat. The following table gives the first digits for some important algebraic and transcendental numbers in both decimal and duodecimal. ^ Matsushita, Shuji (1998). Decimal vs. Duodecimal: An interaction between two systems of numeration. 2nd Meeting of the AFLANG, October 1998, Tokyo. Archived from the original on 2008-10-05. Retrieved 2011-05-29. ^ Mazaudon, Martine (2002). "Les principes de construction du nombre dans les langues tibéto-birmanes". In François, Jacques (ed.). La Pluralité (PDF). Leuven: Peeters. pp. 91–119. ISBN 90-429-1295-2. ^ von Mengden, Ferdinand (2006). "The peculiarities of the Old English numeral system". In Nikolaus Ritt; Herbert Schendl; Christiane Dalton-Puffer; Dieter Kastovsky (eds.). Medieval English and its Heritage: Structure Meaning and Mechanisms of Change. Studies in English Medieval Language and Literature. 16. Frankfurt: Peter Lang. pp. 125–145. ^ von Mengden, Ferdinand (2010). Cardinal Numerals: Old English from a Cross-Linguistic Perspective. Topics in English Linguistics. 67. Berlin; New York: De Gruyter Mouton. pp. 159–161. ^ Pittman, Richard (1990). "Origin of Mesopotamian duodecimal and sexagesimal counting systems". Philippine Journal of Linguistics. 21 (1): 97. ^ Nishikawa, Yoshiaki (2002). "ヒマラヤの満月と十二進法" [The Full Moon in the Himalayas and the Duodecimal System] (in Japanese). Archived from the original on March 29, 2008. Retrieved 2008-03-24. ^ Ifrah, Georges (2000). The Universal History of Numbers: From prehistory to the invention of the computer. John Wiley and Sons. ISBN 0-471-39340-1. Translated from the French by David Bellos, E.F. Harding, Sophie Wood and Ian Monk. ^ Macey, Samuel L. (1989). The Dynamics of Progress: Time, Method, and Measure. Atlanta, Georgia: University of Georgia Press. p. 92. ISBN 978-0-8203-3796-8. ^ a b c d e f g h De Vlieger, Michael (2010). "Symbology Overview" (PDF). The Duodecimal Bulletin. 4X  (2). ^ Andrews, Frank Emerson (1935). New Numbers: How Acceptance of a Duodecimal (12) Base Would Simplify Mathematics. p. 52. ^ Pitman, Isaac (1947). "A Reckoning Reform [reprint from 1857]" (PDF). The Duodecimal Bulletin. 3 (2). ^ a b c "Mo for Megro" (PDF). The Duodecimal Bulletin. 1 (1). 1945. ^ "What should the DSA do about transdecimal characters?". The Dozenal Society of America. Retrieved 2018-01-01. ^ a b Volan, John (July 2015). "Base Annotation Schemes" (PDF). Duodecomal Bulletin. 62. ^ "Annual Meeting of 1973 and Meeting of the Board" (PDF). The Duodecimal Bulletin. 25  (1). 1974. ^ De Vlieger, Michael (2008). "Going Classic" (PDF). The Duodecimal Bulletin. 49  (2). ^ Karl Pentzlin (2013-03-30). "Proposal to encode Duodecimal Digit Forms in the UCS" (PDF). ISO/IEC JTC1/SC2/WG2, Document N4399. Retrieved 2016-05-30. ^ "The Unicode Standard, Version 8.0: Number Forms" (PDF). Unicode Consortium. Retrieved 2016-05-30. ^ "The Unicode Standard 8.0" (PDF). Retrieved 2014-07-18. ^ Scott Pakin (2009). "The Comprehensive LATEX Symbol List" (PDF). Retrieved 2016-05-30. ^ a b Zirkel, Gene (2010). "How Do You Pronounce Dozenals?" (PDF). The Duodecimal Bulletin. 4E  (2). ^ William S. Crosby; "The Uncial Jottings of a Harried Infantryman", The Duodecimal Bulletin, Vol 1 Issue 2, June 1945, Page 9. ^ A. C. Aitken (January 25, 1962) "Twelves and Tens" The Listener. ^ A. C. Aitken (1962) The Case Against Decimalisation. Edinburgh / London: Oliver & Boyd. ^ Carroll, Lee (1995). Kryon—Alchemy of the Human Spirit. The Kryon Writings, Inc. ISBN 0-9636304-8-2. ^ "SchoolhouseRock - Little Twelvetoes". web.archive.org. 6 February 2010. ^ Pendlebury, Tom (May 2011). "TGM. A coherent dozenal metrology based on Time, Gravity and Mass" (PDF). The Dozenal Society of Great Britain. ^ a b Goodman, Donald. "Manual of the Dozenal System" (PDF). Dozenal Society of America. Retrieved 27 April 2018. ^ Suga, Takashi (2002). "Proposal for the Universal Unit System". ^ Michael Thomas De Vlieger (30 November 2011). "Dozenal FAQs" (PDF). The Dozenal Society of America. Savard, John J. G. (2018) . "Changing the Base". quadibloc. Archived from the original on 2018-07-17. Retrieved 2018-07-17.